Let's begin with an anchor chart! 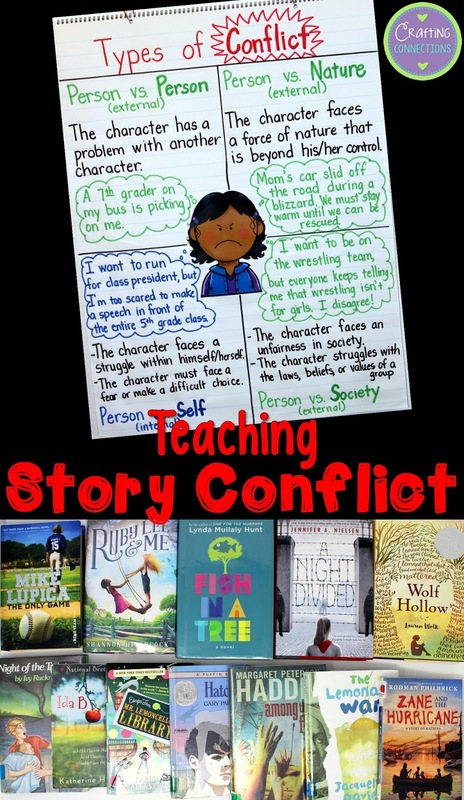 I am a huge fan of anchor charts, so I created a conflict anchor chart that you can share with your students. As you can see, I color-coded it to help students focus on the fact that three of the conflicts are external, and only one type is internal. Also, I chose to use the image of the angry girl to stress that conflicts in stories are rather unpleasant, especially at the point at which the conflict is revealed. Interestingly, my daughters (a 7th grader and a 5th grader) watched me design parts of this anchor chart, and they both asked me (at different times) why I used the image of a girl who was angry. I explained my thought process, but they both told me that they didn't care for my image choice. I'd be curious to know... what's your opinion on the image? If nothing else, one benefit is that it ignited a great discussion about story conflict that we wouldn't have otherwise had. 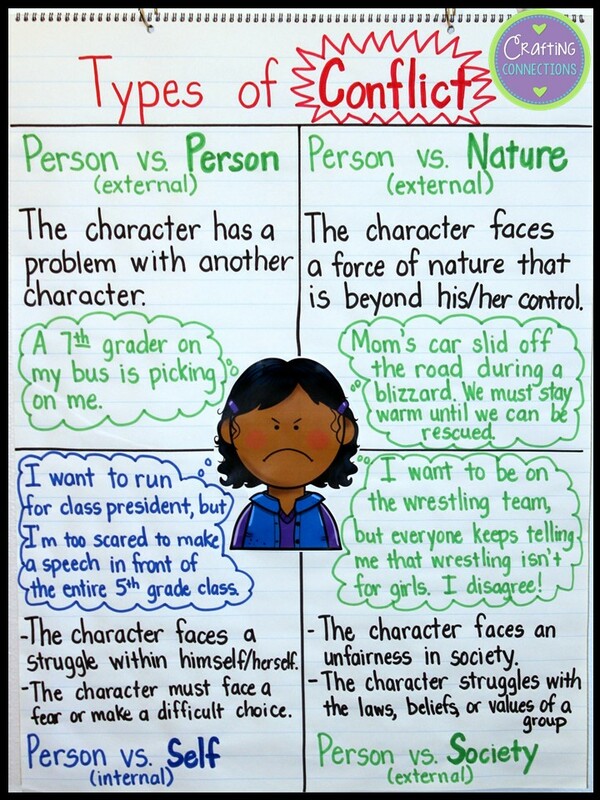 Would you like to replicate this anchor chart? Grab the image for free at Chirp Graphic's TpT store! Analyzing published books and identifying each book's primary conflict is essential for students learning about literary conflict. Therefore, I sat down and compiled a few examples of books that can be matched to each type of conflict. (Keep in mind, however, that some of these books have more than one type of conflict within its overall plot.) The images below show my suggestions for each type of conflict. The Lemonade War by Jacqueline Davies- Siblings Evan and Jessie begin a lemonade stand war, both vowing to earn more money than the other. Wolf Hollow by Lauren Wolk- Annabelle's life is pretty quiet until Betty Glengarry moves into town. At first, Betty only bullies Annabelle, but soon Betty targets a World War I veteran, as well. When Annabelle sees how Betty treats Toby, she can't remain silent any longer. Escape from Mr. Lemoncello's Library by Chris Grabenstein- Kyle Keely is racing to win Mr. Lemoncello's game. In order to win, though, he must beat his conniving archnemesis, Charles Chillington. Hatchet by Gary Paulsen- Brian Robeson finds himself alone in the Canadian wilderness after he is the lone survivor following a plane crash. He must figure out a way to survive until help arrives. Zane and the Hurricane: A Story of Katrina by Rodman Philbrick- Zane is visiting relatives in New Orleans when Hurricane Katrina hits. He is separated from his family, but meets a young girl and an elderly musician. The three work together to survive the disaster. Night of the Twisters by Ivy Ruckman- Dan and his friend Arthur must first survive the tornado ripping their town into shreds, and afterward they must make their way through the rubble to find their family members. 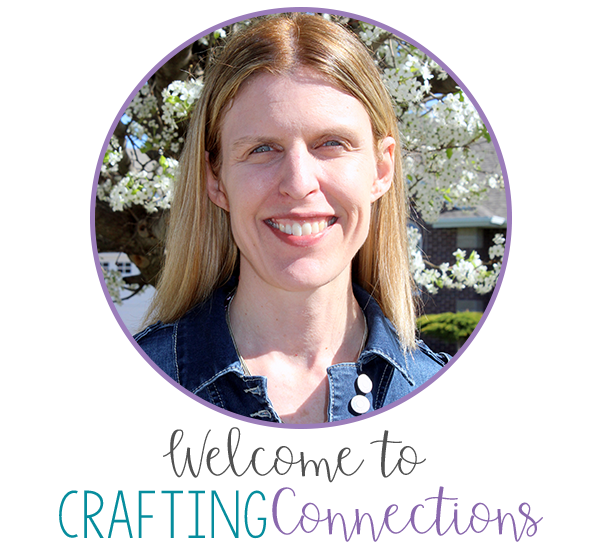 Ida B by Katherine Hannigan- When Ida's mom is diagnosed with cancer, she is no longer able to homeschool Ida, and Ida has to start attending "mind-numbing" school. Ida feeling betrayed as she struggles to accept the changes happening in her life. Fish in a Tree by Lynda Mullaly Hunt- Ally is good at math and art, but she has always struggled with reading. She behaves negatively at times to mask her reading difficulty. Things start to finally turn around for Ally when she meets a supportive teacher along with two classmates who have some struggles of their own. The Only Game by Mike Lupica- Jack is the best pitcher on his 7th grade baseball team. However, he quits after the first practice of the season. He blames himself for an earlier tragedy involving his older brother. Everyone in town thinks baseball is what Jack needs to help him move on, but Jack doesn't agree. Ruby Lee and Me by Shannon Hitchcock- The year is 1969, and Sarah's best friend is Ruby Lee. The trouble is that Ruby Lee is black and Sarah is white. The school is set to be integrated next year, and the first African American teacher has been hired. Tension is high as Sarah tries to navigate through the complex issues of her rural Southern town. A Night Divided by Jennifer Nielsen- Greta used to live with her entire family in East Berlin, but her family is split apart when the Berlin Wall is erected overnight, while her father and brother are visiting West Berlin. Greta can't help but dream of freedom in the West, even though those types of thoughts are forbidden. Years pass, and Greta is resentful. She is thinking about risking her life in order to live a life of freedom. Among the Free by Margaret Peterson Haddix- This is the author's final book in the Shadow Children series. In this book, Luke accidentally sets off a rebellion that results in the overthrow of the government. The people are finally free, but there are still plenty of questions. You may choose to use the list I've provided in a number of ways, but this is the activity I would do because it keeps everyone engaged. I would write the numbers 1 through 4 on sticky notes, and then place each sticky note on one quadrant of the anchor chart (1 in Person vs. Person, 2 in Person vs. Nature, etc.) Then I would tell my students that I'm going to show them a book and read a brief summary. As they are listening to the summary, they need to determine the type of conflict that is being revealed. After I've finished reading the summary, I'd allow students a moment to turn to a partner to discuss their answer. Then, when I say "Reveal your answer", students hold up the number of fingers that correspond with their chosen answer. 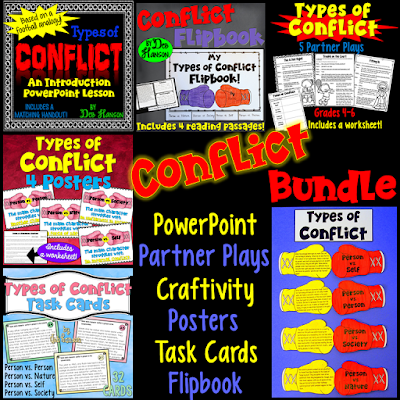 If you are looking for additional resources for teaching conflict to your upper elementary students, feel free to check out the following resource. I have placed my bundle image here, but all of these items are also available for individual purchase in my TpT store.